Some of my friends had asked for the recipe to make Thekuas/Khajoors (a sort of Indian home-made cookies) 🙂 Just scribbled some quick notes below. Hope it helps 🙂 Special thanks to my mom and sis for helping me out with this! Enjoy !! 5. Now deep fry the thekuas in hot refined oil, stroking (if needed) gently so as to avoid breaking the thekua. DO NOT fry more than 4-5 pieces at once. The oil should be very hot when you put these pieces for frying, otherwise the thekuas will tend to break. Cook on a high flame. In case the thekuas still tend to break, add 1-2 tbsp of maida to the dough and mix well. Use gentle hands when stroking/flipping the thekua pieces while being fried. 7. 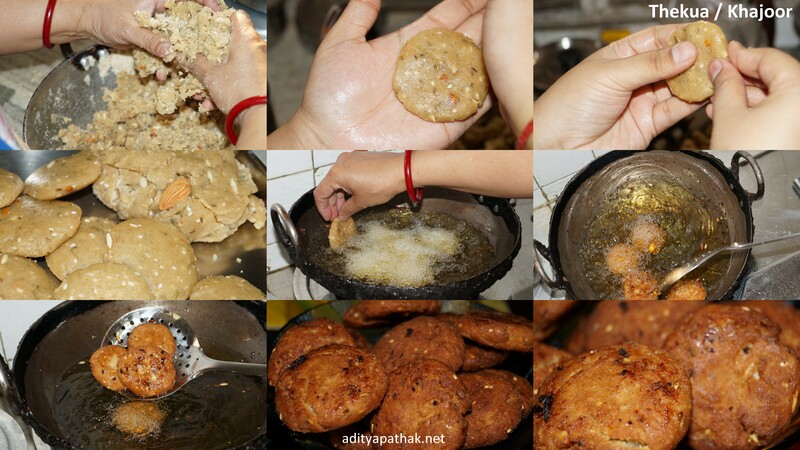 Leave the thekuas on the newspaper for air-cooling for a while, so that they become firm and crisp at room temperature. Next Next post: Town Hall, Fatehpuri Masjid, Khari Baoli, Gadodia Market and much more from Chandni Chowk!